Desires: Six beautiful destinations for New Year’s Eve and the perfect dreamy accessories to wear; The most popular tv series’ protagonists matching with contemporary jewels. People & Brands: Marco Broggian, new CEO of Mimi, talks about the future of the brand. 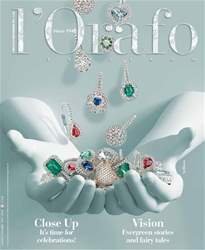 Vision: A new section of l’Orafo Italiano entirely dedicated to the world of bijoux. The company: Nelson; Appeal: Midnight magic, Orange and Glitter; Trend: Moon, Princess and Enchanted Forest. Visual: High jewellery inspired by the aesthetic Far East influence. Inside Jewelry: Reports from Hong Kong Jewellery & Gem Fair, VicenzaOro September and Homi; Economy: export remains a strong point of Italian jewellery manufacturing; Gemology: the controversial entry of De Beers in the market of synthetic diamonds.